In the CLASSIQUE range, find our gourmet, tobacco or fruity flavors deliciously rendered, sweet and soft on the tongue, that give you all the fun of vaping without the risk. 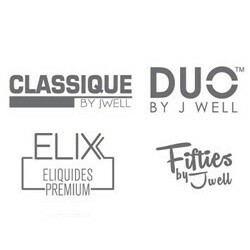 Whether you are in the mood for something slight sour, bubbly, caramel cocktail or anything else, J WELL designed a liquid for all your needs! Jwell offers in this classic gourmand range exclusive flavors of pharmaceutical quality in this range, all 100% made in France in compliance with ISO 22000 standards. E-liquid met de smaak Cola Lalala . E-liquid met een royale tabak smaak. E-liquid met de smaak van blonde tabak . E-liquid met de smaak van rood fruit .